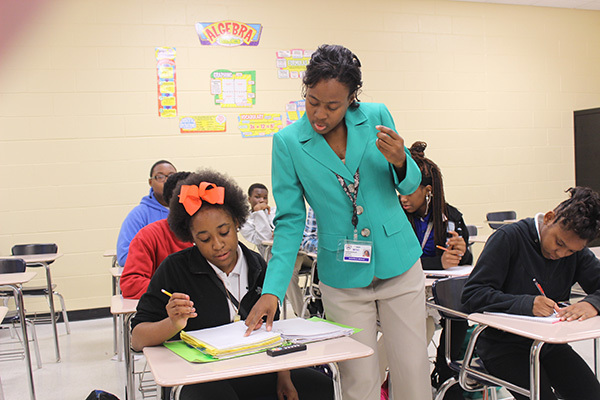 The bonds of a close-knit family helped Magnolia Middle School math teacher Rhonda Burrage reach out beyond the call of duty to help students in the entire Meridian Public School District. 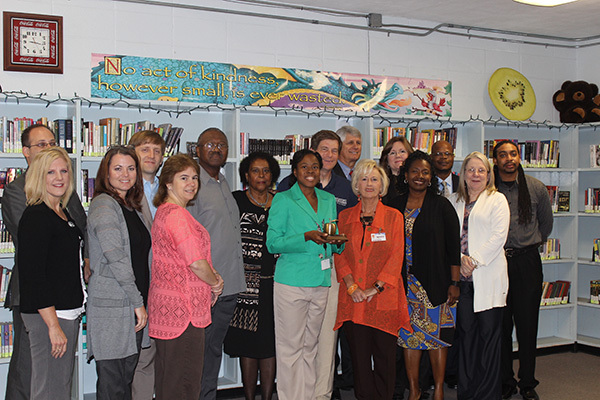 Burrage's efforts have earned her the Golden Apple Teacher of the Month award for the month of October. 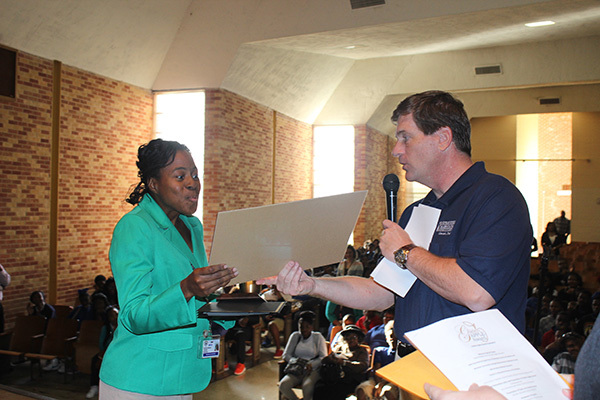 Burrage was surprised with the award at a school pep rally attended by her parents. "Everyone wants to be recognized for the good things they do and the accomplishments they make," Burrage said. "So I was very shocked." Having her parents there meant even more. "They told me on a daily basis how proud they are," Burrage said. "Parents do matter and the community matters also." 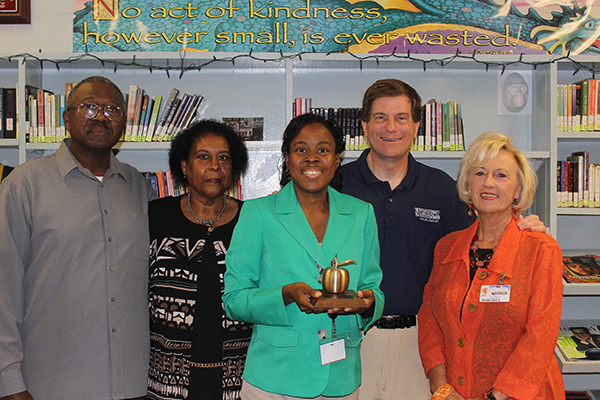 As a Golden Apple winner, Burrage will receive a $300 cash prize, a Golden Apple trophy, a $150 donation to an "Adopt a Classroom" account and a donation of school supplies. Burrage, along with seven other Golden Apple Teach of the Month award winners will be invited to a banquet at the end of the school year where the Teacher of the Year will be named. The Teacher of the Year will receive $2,500 cash and a $2,500 scholarship to be awarded to a deserving student in the teacher's name. Burrage, who teaches Algebra I and pre-Algebra, credits her seventh grade teacher at West Lauderdale Middle School for her love of math. "Ever since my seventh grade year, and because of Mrs. (Jeffrey) Mayatt, I've always wanted to be a math teacher," Burrage said. "She was awesome. I was fortunate to have really good math teachers throughout my educational career. But it was my seventh grade teacher, because it is where I started tutoring other students and I learned my knack for breaking things down into simpler steps so that other students can understand." Meridian Public School District Superintendent Dr. Alvin Taylor said Burrage is one of the district's rising stars. "When you have that sincere love for education she doesn't view as work or a job. She does it 24-7. And its what makes her special," Taylor said. "She works on the district's advisory committee, which works on curriculum, test items and teaching strategies. She worked all summer with the one-to-one technology, getting those laptops in and get them loaded with instructional programs. She's all over the place." Magnolia Middle School Principal Angela McQuarley said Burrage hasn't missed a day at her school for three consecutive years. "… Her students are proficient on state assessments," McQuarley said. "She stays after school and she goes beyond by tutoring children who are not at Magnolia." Burrage said her love of teaching math comes through when she sees her students get it. "I love it when the you see the light bulbs go off in students and you see that they get the concept and you can see in their expression, they do understand and then they want to share it with others," Burrage said. "So I love it." A good administration can also make a difference, Burrage said. "The administration really listens to us about what we can do inside the classroom," she said. "They ask us, 'How we can make it better?' When the administration can make it better for us teachers, we can make it better for the students." Burrage has been teaching for seven years. After graduating from West Lauderdale High School she went to Meridian Community College to get her Associate of Arts Degree. She then went to Mississippi State University and received both her Bachelor of Arts Degree and her Masters of Science in Secondary Mathematics Education. The solid educational background has left her with a simple philosophy on teaching. "Try to reach every single student," Burrage said. "Try to have a good rapport with students. Meet them where they are and then build a foundation of knowledge. When you can reach them where they are and increase their knowledge, they will pretty much do what you ask them to do. Also, have good classroom management skills, have a good rapport with your students, build on basic knowledge and always keep in contact with parents." Richard Schwartz, from Richard Schwartz and Associates in Jackson, is the October sponsor of the Golden Apple Award, back for its fourth year in saluting the hard work and excellence of teachers in the east Mississippi and West Alabama area. 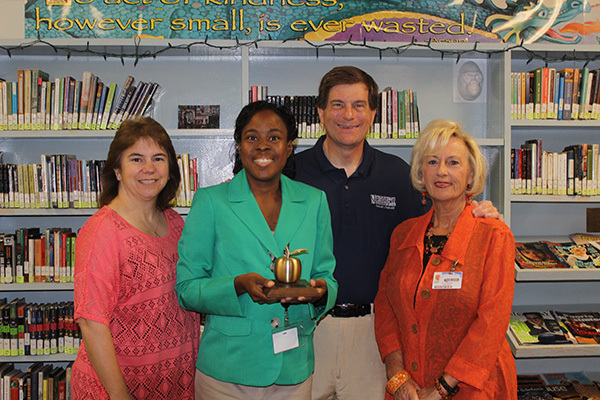 Schwartz said getting involved with the Golden Apple program was a natural fit. "I got involved with it when it came out four years ago, because I remember how teachers were so effective in my life. I want to tell kids how important teachers are," Schwartz said. "I'm all over Mississippi, but I am from Mississippi, born and raised here, and I support all communities in Mississippi and Meridian is one of them. Good teachers give them a direction in life and they should be rewarded." 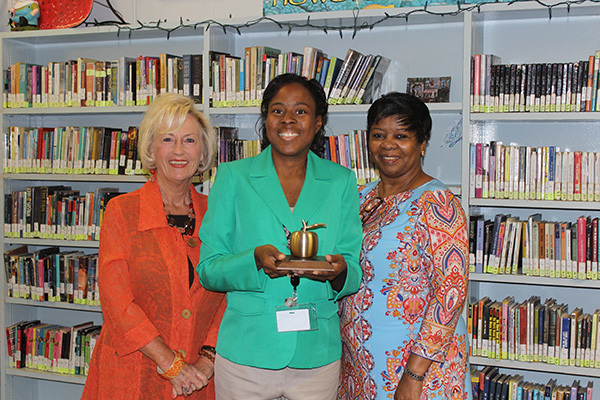 The Golden Apple Award is open to any educator, graders kindergarten through 12th grade who works in the following: Lauderdale, Neshoba, Kemper, Clarke, and Newton counties in Mississippi, or Choctaw and Sumter counties in Alabama.